Armed with the most powerful GeForce GTX graphics cards from the Nvidia 10-Series line-up, Dino PC will be launching a range of systems which have been specifically tweaked and tested to take full advantage of the Pascal architecture. With a carefully chosen selection of high-performance components, the Nvidia Battlebox systems designed by Dino PC will ensure monstrous levels of processing power, uncompromised efficiency in reliable overclocking, and a solid build structure utilizing the finest chassis. 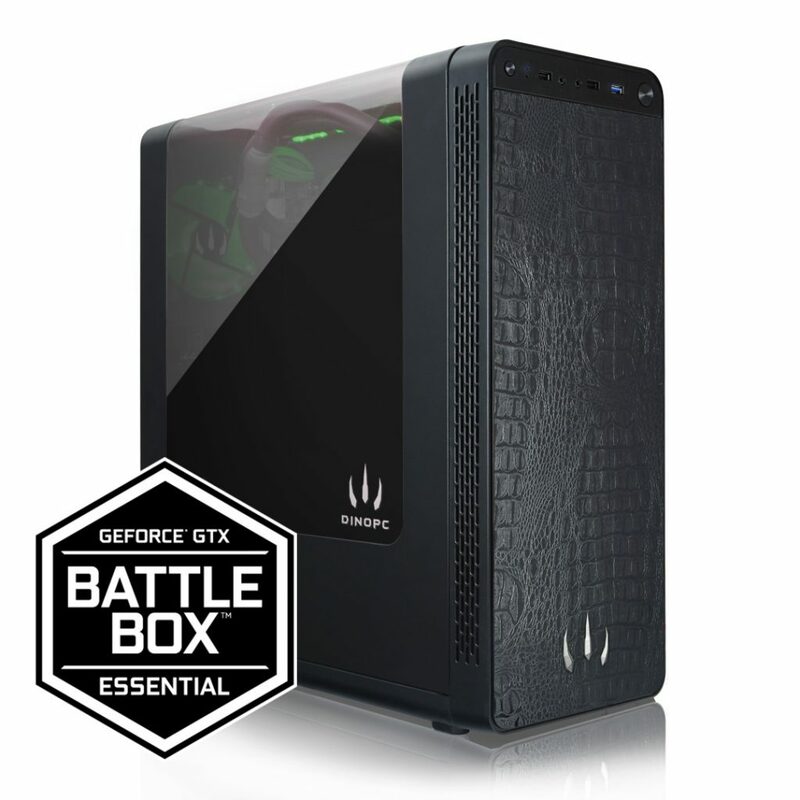 Designed to meet the needs of every gamer, whether it’s casual gaming or competing in eSports, each tier of Dino PC’s Battlebox systems have been effectively crafted for delivering incredible gameplay experiences. Featuring CPU choices from Intel and AMD, gamers will be able to configure Quad-Core and 8-Core systems, equipped with up to 32GB of Corsair Vengeance DDR4 memory. Ensuring every system is free from bottlenecks and receiving reliable power to perform at its greatest, only the finest power supplies of an 80 PLUS rating will be present in the systems. Appropriately named after the most powerful beasts to ever traverse the lands, every Battlebox system has been carefully tamed in order to harness the power of GeForce GTX 10-Series graphics cards. 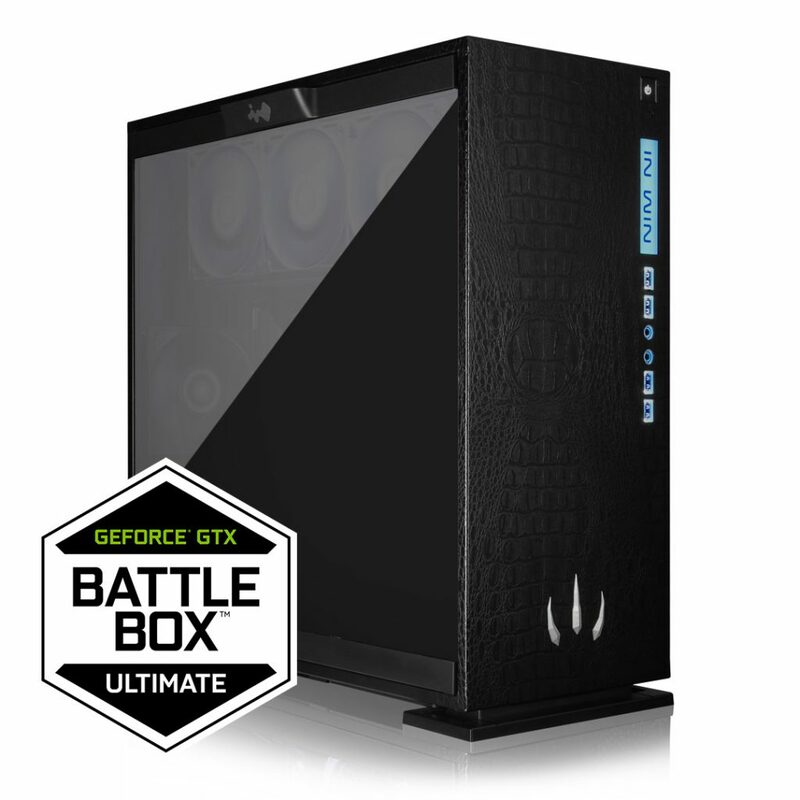 Known as the Battlebox Sino 1060 the system features a GeForce GTX 1060 6GB graphics card. Paired with an Intel Core i5 7600K CPU clocked at 4.6GHz, immense processing power is delivered as standard – efficiently cooled by a Corsair Hydro H75 liquid cooler. Available in a selection of iconic vinyl wrapping, the Thermaltake View 27 plays host to this incredible system. 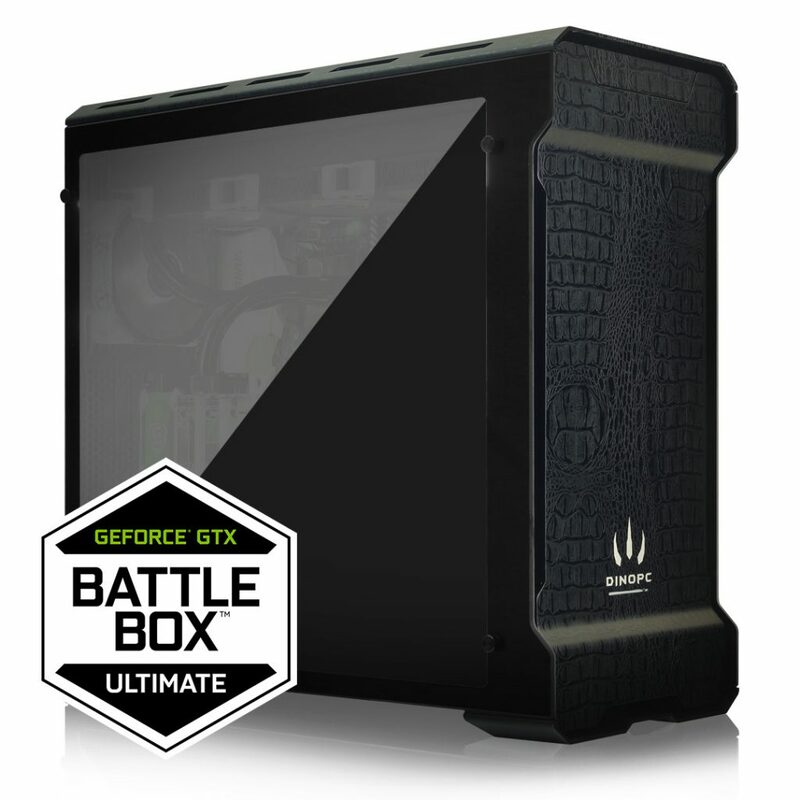 Packing an Intel Core i7 7700K processor – stable and reliable at 4.8GHz, the Nvidia Battlebox Utah STRIX is the next step up for an enhanced gaming experience. With a GeForce GTX 1080Ti residing deep within its chambers, 11GB of GDDR5X memory and an overclocked boost speed of 1645MHz ensures volcanic levels of performance – proving ideal for true 4K gaming. Giving way to impressive boot-times and instant loading of games and applications, a Samsung 960 EVO M.2 drive arrives as standard with options for additional storage provided as necessary. Sealed within a tempered glass panel by the means of an In Win 303 chassis, the aggressive appearance of the Utah Strix is one to look at but never dare touch. Equipped with the latest AMD Ryzen processor and a GeForce GTX 1080Ti, the sleeping beast has finally awoken. Delivering 8 Cores and 16 Threads of 4GHz processing power, the Ryzen 7 1800X CPU has been architecturally designed for both gamers and content creators, for simultaneous multi-processing of extensive computing. Eliminating bottlenecks with 32GB of 3000MHz DDR4 memory, the Asus Crosshair VI Hero motherboard ties everything together allowing for great control and customization features with the highest manufacturing quality of component implementation. Those willing to seek out such an immense level of power need not look further than the Battlebox Krono Carbide. Crafted for those with an appetite for power, for those not willing to compromise any measurement of graphical processing performance, for those seeking the ultimate weapon that will push past the pixel barrier and break through the frame rate space-continuum of the laws set by FRAPS – the Battlebox Krono Enthoo X2 is the perfect solution. 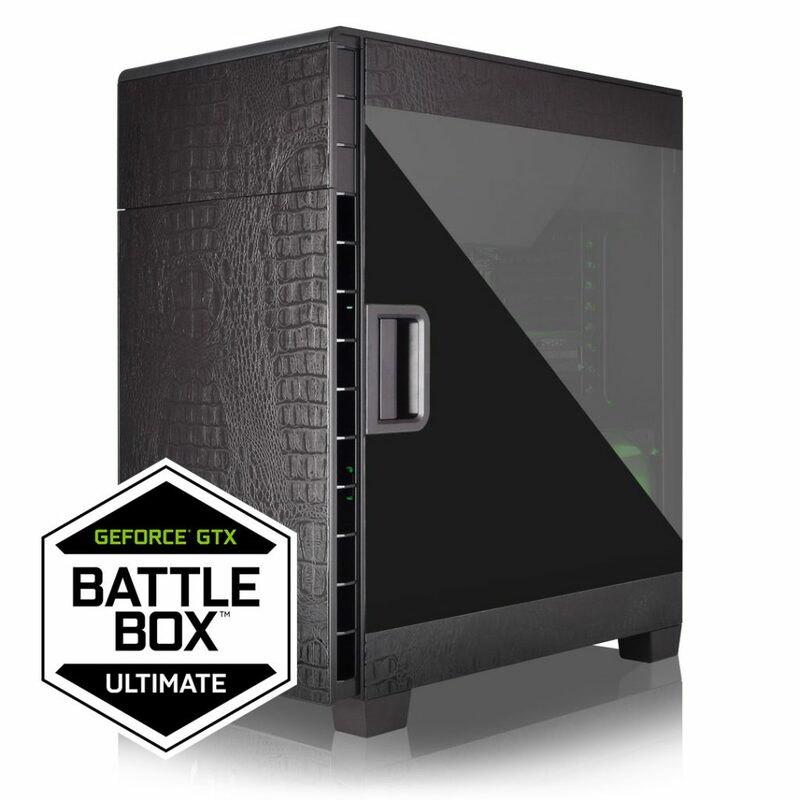 Engineered by the most talented of builders, the highest performing Nvidia Battlebox designed by Dino PC takes no shortcuts in delivering God-like performance. Sitting at the heart of the system is an Intel Core i7 7700K CPU. Rocking a 4.5GHz clock speed across all cores and retaining stable under load, thermal dissipation is taken care of by a Corsair Hydro Series H100i V2 Extreme liquid cooler. Keeping the beast cool as to ensure consistent performance and reliability in use, only the finest liquid coolers received an audition. Requiring an additional level of power in order to appease the pair of GeForce GTX 1080Ti graphics cards for maximum performance and dual-GPU scaling, a Corsair AX Series Digital modular AX1200 power supply was up to the duty. With its 80 PLUS Platinum rating and extreme levels of energy-efficiency for clean consistent power, competing power supplies appear ancient by comparison. Liquid cooling at its finest. Powered by a GeForce GTX 1080Ti with an Intel Core i7 7700K at 4.5GHz, the Tyrann Ultimate receives the full treatment of enthusiast-class premium watercooling – bearing the mark of the beast for reassurance of power. 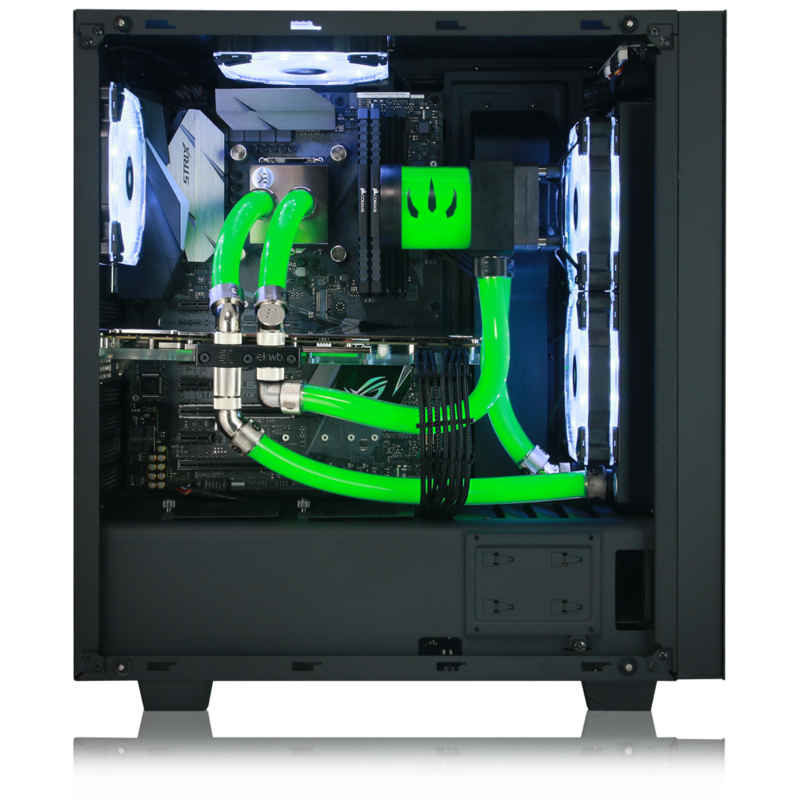 Crafted with EKWB’s top of the line water blocks and tubing, the custom-braided cables add the finishing touch to this monster of a system. Carrying the seal of approval with the Nvidia Battlebox logo present across all configurations, Dino PC’s new breed of gaming systems have been officially certified and are available to buy.